For several decades, women craving the feeling of relaxation before bed have turned to their favorite Shadowline nightgown. That’s no coincidence either. At Shadowline, we design nightgowns for women meant to provide the feeling of total comfort. Explore the cuts, the colors, the fabrics, and the styles that make our ladies’ nightgowns longtime favorites. What Makes Shadowline® Nightgowns Unique? We’ve heard from our loyal fans that a Shadowline nightgown is simply like nothing else — and we tend to agree. Our nightgowns stand out from the crowd for three reasons: the stunning look, the high quality, and the philosophy behind all our products. Our women’s nightgowns and plus size nightgowns look gorgeous because of the variety of striking styles we design as well as the splendid materials we use. From our long nightgowns to our flirty babydoll nightgowns, all of our products are designed to look gorgeous — and make you feel that way, too. Since our goal is to make the products that you enjoy for life, we only produce the highest quality pieces using long-lasting materials. Shadowline lovers tend to get attached to their sleeping gowns, their loungewear, and all of our other great products. We want to make sure that those products will be around to be cherished for quite a while. In addition to using the best production methods, our products last so long because of our lines of silky yet strong fabrics like Modal / Spandex, Satin Charmeuse, Satintrique® and Opacitrique®. When it comes to our trademark night gowns, the Shadowline philosophy is that style and comfort go hand-in-hand. We want our cute nightgowns to become a relaxing part of your nighttime routine. We also want you to look great and feel confident when wearing your Shadowline nightgown. Simply put, we make nightgowns for women who want to relax and who also want to feel beautiful while they do it. No matter your personal style and taste, we have the nightgown for you. If you want to emphasize your flirty side, you’ll gravitate towards favorites like our Silky Ballet Nightgown and the Short Baby Doll Nightgown. However, if you’d rather have a full coverage nightgown in which you feel comfortable wearing around the house, we have gorgeous selections for you, too. Our long nightgowns still possess the same sweeping styles that make our shorter pieces a hit. 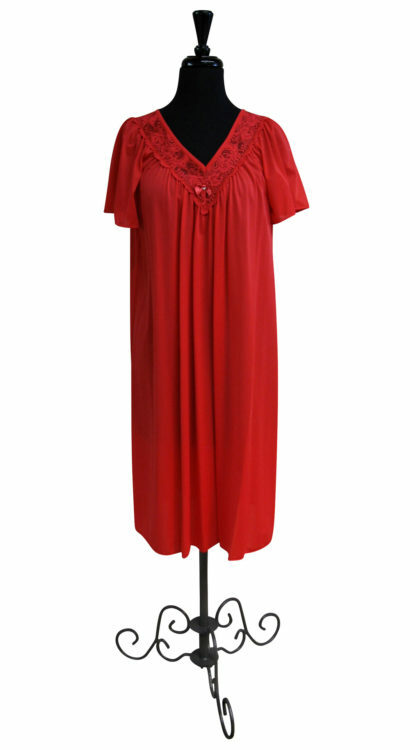 Check out our Floor Length Long Nightgown and our stylish Three-Quarter Sleeve Nightgown. If you want a sleeping gown that is cute yet has full coverage, we have numerous stunning pieces for you. Check out our Short Flutter Sleeve Nightgown or our Cotton Batiste Nightgown. In addition to our wide range of styles, we also have a range of sizes as well. We design and produce everything from Misses options to plus size nightgowns. At Shadowline, we’re all about making clothes that standout as the most relaxing part of a woman’s day. We’ve been designing lingerie for long enough to know that true relaxation not only comes from the gentle cut and the luxurious fabric but from feeling truly comfortable in your clothes. What to Pair with Your Shadowline® Nightgown? If you cherish your nightgown from Shadowline, chances are that you’ll love indulging in some of our other women’s sleepwear as well. Our ever-popular Before Bed collection features some of our modern and exciting lounge wear choices. The robes from this collection can be worn with almost any nightgown. If you’re looking for something truly dazzling, discover the shimmering style of our satin nightgowns belonging to the Charming collection. No matter what you choose and how you choose to indulge, we hope you love your Shadowline as much as we do!